UK: Hungry for More Easing? The votes are in! Just as expected, most of the members of the BOE‘s monetary policy committee (MPC) agreed to keep interest rates at 0.5% and end their asset-purchase program at 200 billion GBP. The minutes of their August meeting revealed that the policymakers were actually less dovish than usual since they began to acknowledge the recent improvements in UK’s inflation and GDP growth. However, MPC member Andrew Sentance remained the lone policymaker pushing for a 25 basis point rate hike. He pointed out that the stronger-than-expected GDP growth for the second quarter of 2010 confirms that the UK’s economic recovery has already gathered enough momentum. And for the last three meetings, Sentance insisted that rising inflationary pressures in the UK were enough to warrant a rate hike. But I guess nobody saw the glass half full like Mr. Sentance. Third time ain’t the charm, eh? Wait a minute, didn’t inflation choke this July? Taking a look at the most recent set of CPI data, we see that inflation clocked in softer than expected, thanks mostly to cheaper transport costs. I guess it’s time to take that Hummer out for a ride! Clothing, miscellaneous goods and services, and recreation and culture also had a hand in the downward pressure on CPI. As a result, after showing a 3.2% year-on-year uptick in June, CPI fell slightly to 3.1% in July. Similarly, core CPI dropped like a hot potato from 3.1% in June to just 2.6% in July to print 0.4% lower than projected. 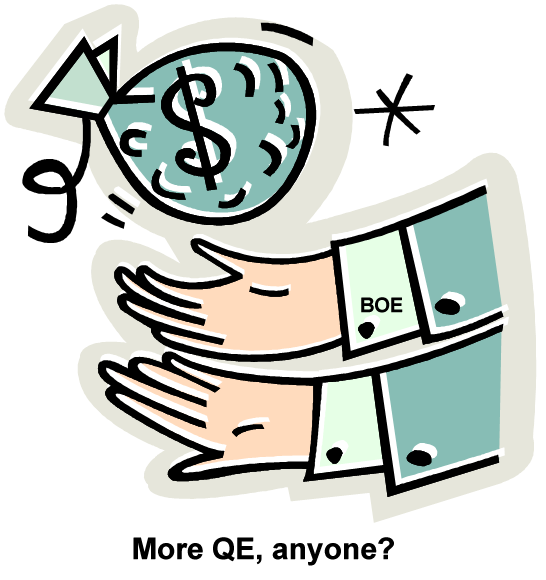 If inflation continues to soften, the BOE will have even more reason to gloat. I have a weird feeling we’ll see just that, especially since the UK’s spare capacity and the impact of their austerity measures could weigh down on inflation in the future. Remember that, even though our buddies over at the MPC have decided to end the asset purchase facility, they haven’t exactly closed the door the whole way through. Aside from internal weaknesses, what also has to be taken into account is the weakness in global recovery. If super powers like the US and euro zone are posting dismal results, then most likely this will lead to less demand for UK exports. In order to keep their options open, the MPC must remain open to the possibility of additional bond purchases down the line, should the economy need a couple more shots of stimulus steroids. Where does this leave the pound? Obviously, this makes the pound’s outlook at little cloudier. More quantitative easing and lower interest rates is a recipe for more weakness down the road. But hey, if the current level of monetary policy measures isn’t getting the job done, then what other choice does the BOE have?